When I was a child, my family and I lived for a couple of years in a pine forest. Not because we were Beatrix Potter style charming woodland creatures, but because my mother was scared of the wind. You see, we had arrived from England in the mid 1970’s and my parents had chosen the Marlborough Sounds as the ideal place to live. We hadn’t been there long when it became clear that the wind which periodically howled through The Sounds was slowly driving my mother crazy. At first she resisted – when the wind started up at night, she would get my sister and I out of our beds in the upper storey of our A-frame house, tell us to put our mattresses up against the visibly buckling ranch slider windows and sleep downstairs. But eventually she realised that this level of anxiety was untenable, and when our goat tragically hung itself, she decided that it was time to move house. My mother confronted my father and demanded that he find the town in New Zealand that was furthest from the sea, and therefore the wind. Fortunately he is a Master Mariner and consequently entirely qualified to find such a place. After consulting various maps, charts and taking sightings on his sextant, he determined that we should move to the teeming metropolis known as Minginui. Not only was it way the hell inland, in the middle of the Ureweras, but it was surrounded by a Radiata Pine shelter belt. Surely my mother would be safe from the wind there. And so it was that we moved to Minginui, and lived there for a couple of years amongst the trees. This formative childhood experience left me with an unfashionable fondness for pine forests, as well as the conviction that as soon as it gets windy, everyone should be putting mattresses up against their windows. 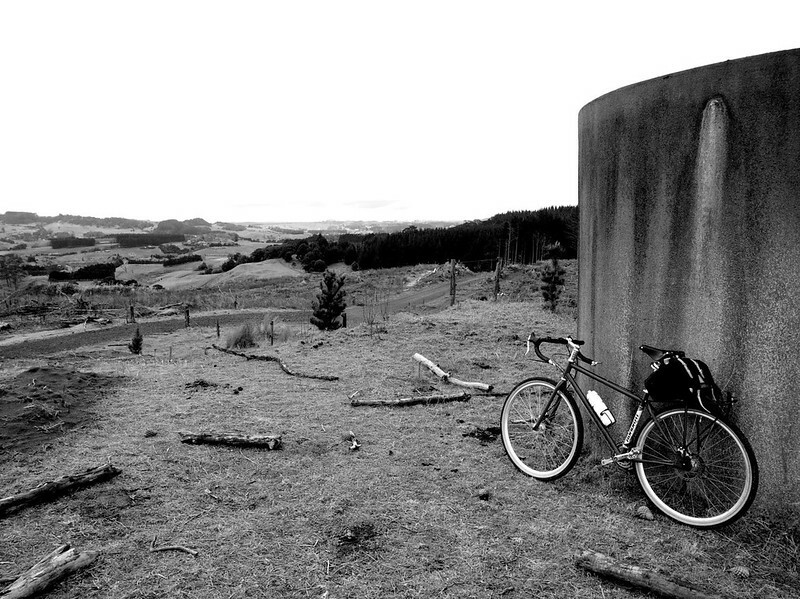 I was thinking about Minginui on a rainy Tuesday morning in the Woodhill Forest Mountain Bike Park. It’s years since I’ve done any proper mountain biking. 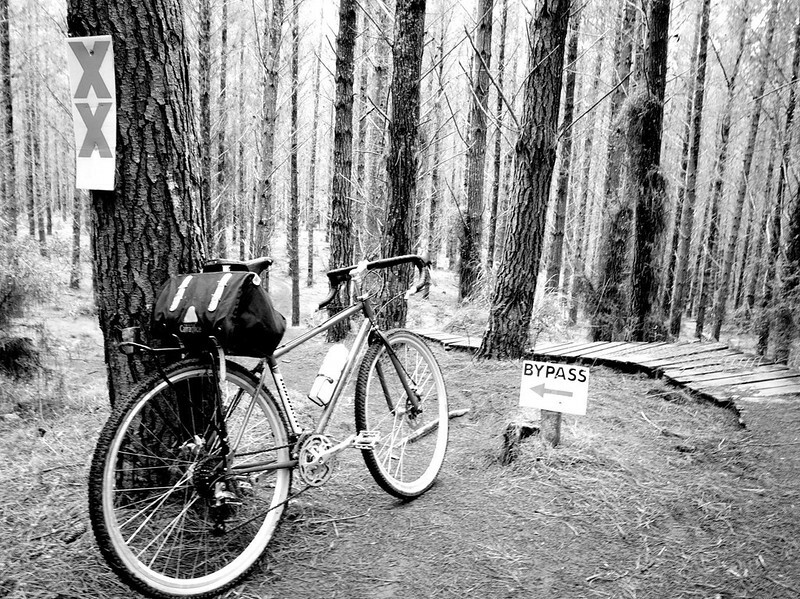 In my early twenties I owned a flourescent-orange Diamondback Ascent and my friends & I would frequently thrash our bikes and ourselves around the Riverhead & Woodhill forests. Before there was a park and before bicycles had suspension. I had gotten the urge to reacquaint myself with Woodhill but I didn’t want to drive up there. 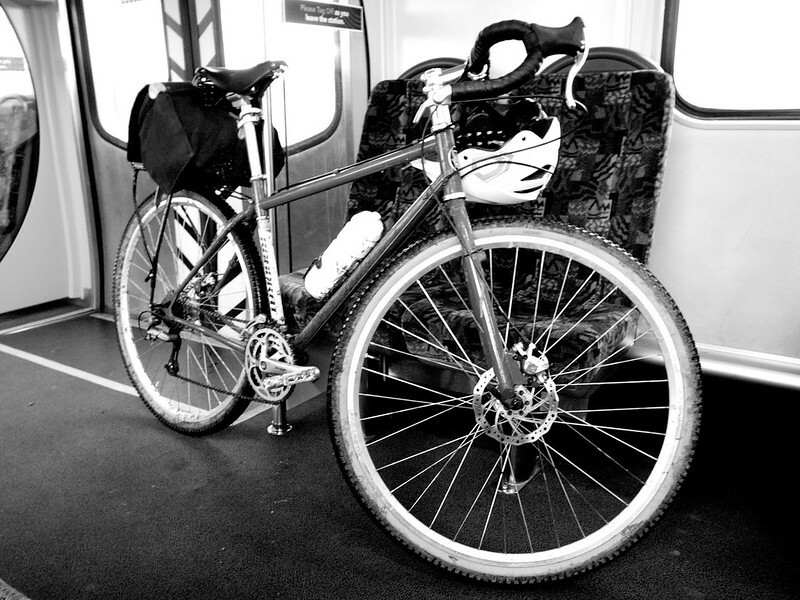 So the Off-Roadrat and I caught the train from Auckland city out to the Waitakere station and rode the remaining 25km. Most of the way it was pleasantly quiet backroads, but there was a stretch of about 5km on the main highway to traverse. 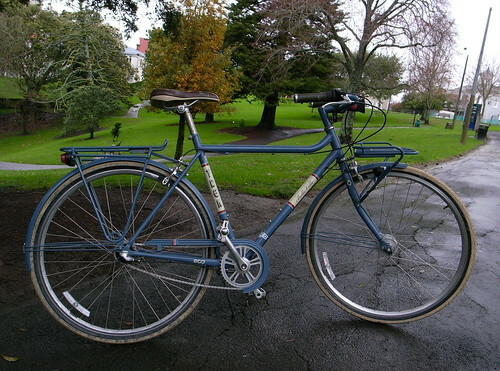 Last year I was pottering about on TradeMe, looking for nothing in particular, when I cam across a Salsa Casseroll frame. It was a 2008 model which, strangely no one else seemed interested in. It came with a Chris King headset and Salsa seatpost & stem. I managed to resist the first time it appeared, but when it was relisted at an even lower price, I caved in and bid. I was the only one who did, and it was all mine for only $280. 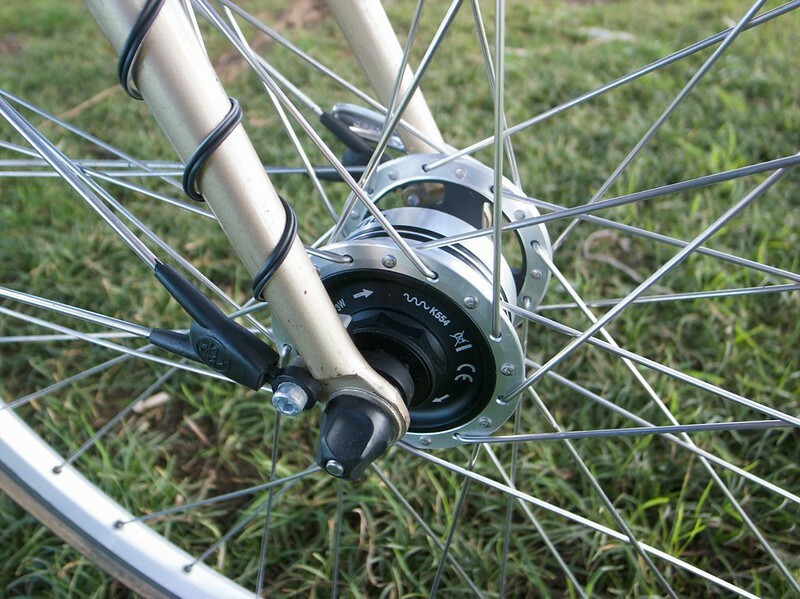 Soon after, also from TradeMe I bought a set of wheels – Mavic OpenPro rims, Shimano Ultegra hubs, with 72 spokes between them. I hid the wheels & the frame behind the couch for a few weeks while I scoured various exotic corners of the Internet for more parts. From XXCycle in France, I bought a Stronglight crankset. Why the Stronglight? Three reasons, they’re reasonably cheap, they’re quite good looking (I really don’t like those modern Shimano cranksets that look like a stingray is glued to your bottom bracket) and they come in a good range of sizes. The ‘standard’ 50t road ‘big ring’ is too big for me, and I wanted a low bottom gear for ascending some of the very steep hills you find in a city built on 57 volcanoes. So I chose a 48/34 and put a mountain cassette (11-34) on the back. This has worked out really well – I spend most of my time in the outer ring, and the middle third of the cassette. If necessary I can crawl up steep hill in the 1:1 bottom gear, and I have never spun out in the top gear. Lying around in the garage, I had a set of Miche dual-pivot brakes. So installed them hooked up to nice Tektro levers. To change gears I bought 9-speed Ultegra bar-ends. Why bar-ends? I like their simplicity and versatility, also if the indexing gets screwed up, you can switch them to friction. 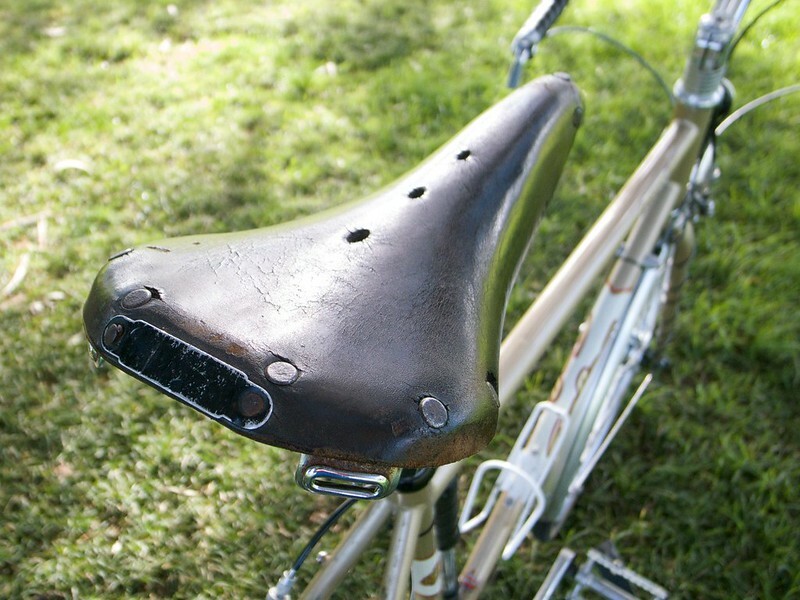 I was very fortunate with the all important contact points – the saddle is an old Brooks I salvaged from a 1970’s Peugeot, and the handlebars are Grand Bois Maes Parallel that I found on sale at Planet-X in the UK. Both of these items are very comfortable. At first I put on Shimano Deore deraileurs, but I have since replaced them with Shimano 105. 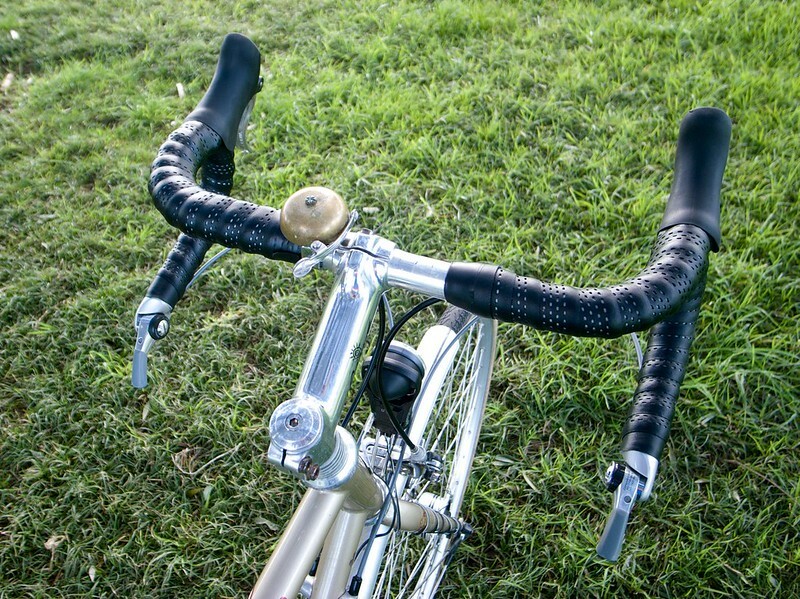 The tyres are the classic Panaracer Paselsa TGs. Built up like this, it was my Sunday rider. But I don’t really ride on Sundays, so it wasn’t getting much use. 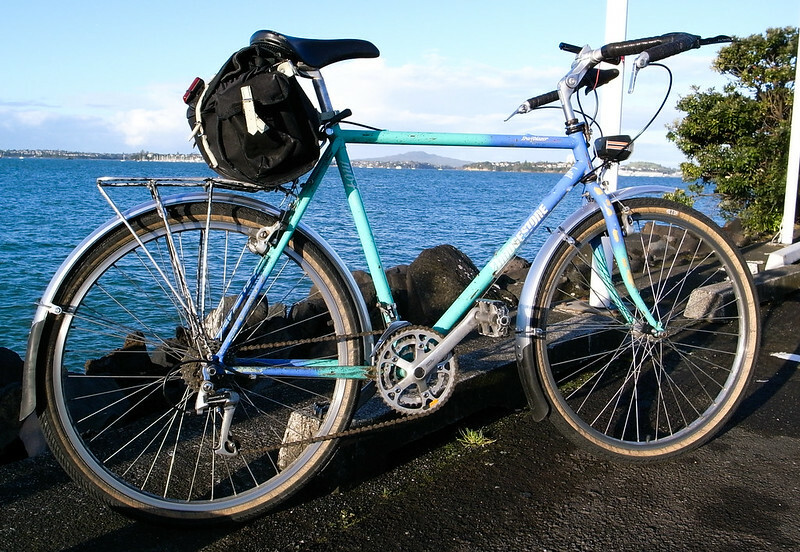 I thought I’d try riding it to work, this required the addition of some accessories – via TradeMe, a Tubus Fly rack, from Rose Bikes in Germany, a B&M Lumotec IQ Fly-T Senso Plus front light, SKS mudguards and dynamo hub front wheel. I’m not an especially competitive cyclist, but I do like an interesting ride. 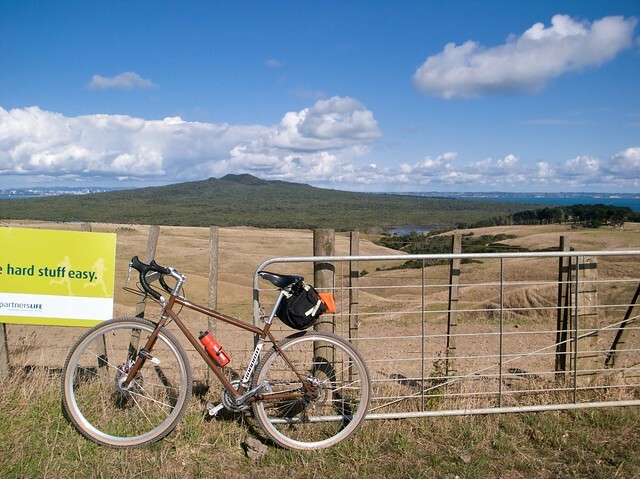 So when I heard about this race called The Dual, taking place on Mototapu and Rangitoto Island, I was keen. Not because I wanted to race other people, but it just looked like a chance to ride around a beautiful place that you aren’t usually allowed to ride around. In the weeks before the race I turned The Roadrat into The Offroad Rat and tried riding further more frequently (I believe this is called training). I thought I was feeling reasonably prepared, but in the last few days prior to the event, I had trouble sleeping and had nightmares that my ex-girlfriend was trying to smother me with a pillow. I don’t think it was the actual ride I was worried about, so much as the logistics – dropping my bike off at this place, picking up this stuff from from there, remembering to bring these things on the day, and very importantly – getting down to the ferry in time. But as it turned out, all that stuff all went quite smoothly, so by the time the ferry left downtown at 7am on the Saturday morning, all I had to do was follow everybody else. 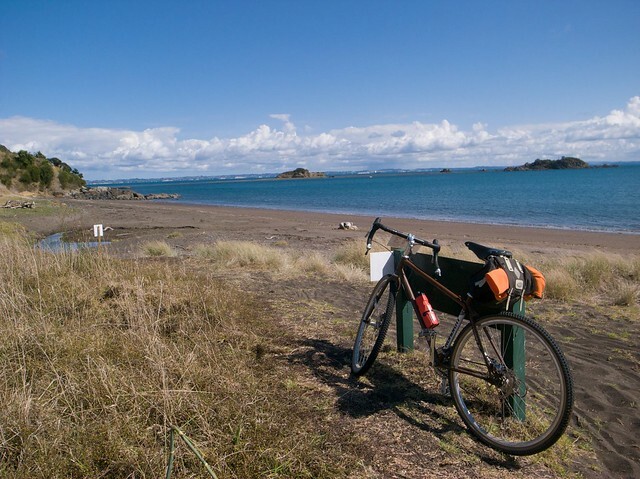 After we all arrived at Home Bay on Mototapu Island, there was plenty of time to retrieve our bikes and watch the triatheletes swim up and down. At about 8:30 we were summoned to our pre-race briefing where we heard about the bird trust and were told to be careful. There was an interruption to this – a loud bang. When we all turned to look, we could see a very non-plussed looking man holding a bike with the tyre hanging off the front wheel along with some shreds of recently-expoloded inner tube. It was at this point that I noticed everyone else had brought their bikes to the briefing, while I had just wandered over by myself. Why? I thought. The answer was provided when the briefing concluded and we were informed that the race would start in 2 minutes. By the time I had fetched the Roadrat and packed my stuff, everybody else had gone. So I cut through between a couple of tents and started the race third to last. 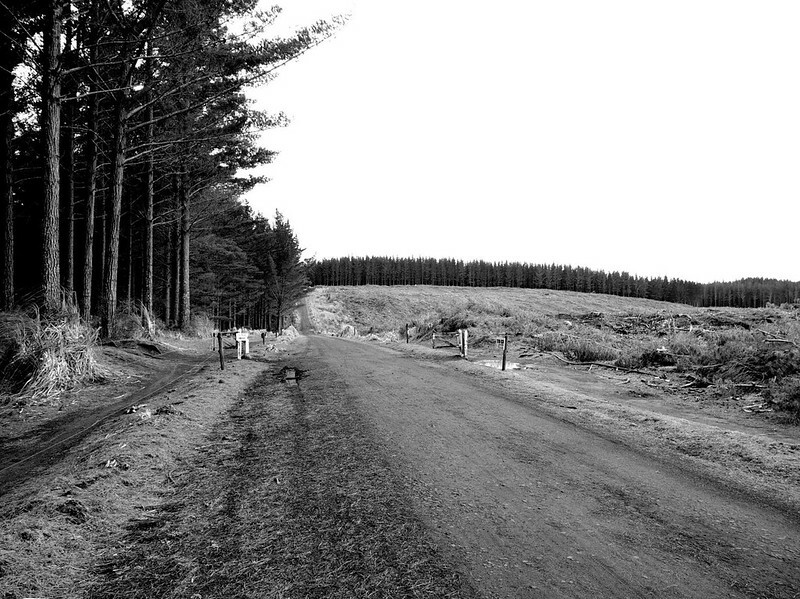 The first part of the course was up and down gravel roads on Mototapu, where I learned that a) the Off-Roadrat is pretty happy on those roads, b) I’m faster than some people riding up hills, and c) I’m slower than almost everyone riding down hills. 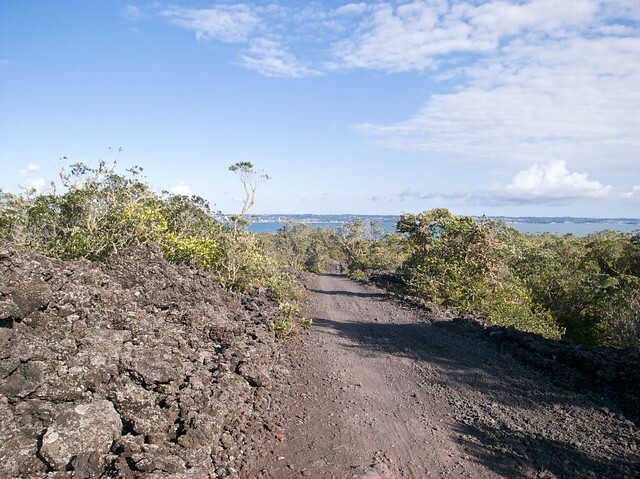 Then it was across to Rangitoto and what became quite a steep ascent. Coming down the other side was, frankly, terrifying. 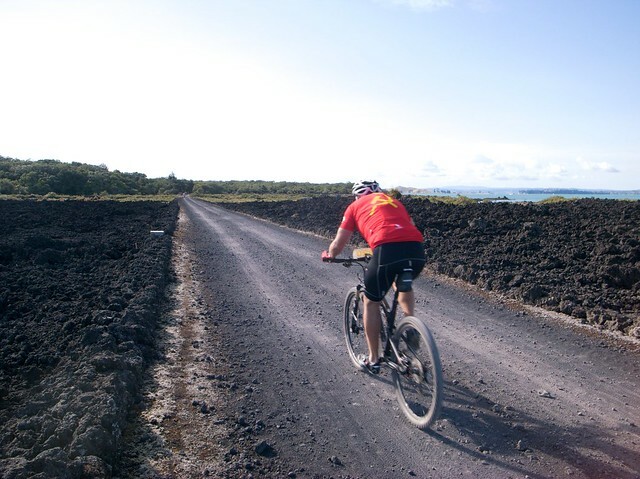 It was a loose gravel “road” surrounded by nasty-looking volcanic rocks. Crashing on your way down there would be very unpleasant. This is probably why an ambulance was placed there. Part way down, I came across a guy carrying his bike, so I asked him what was up. He told me he had just gotten his second flat tyre and didn’t have a second spare tube. 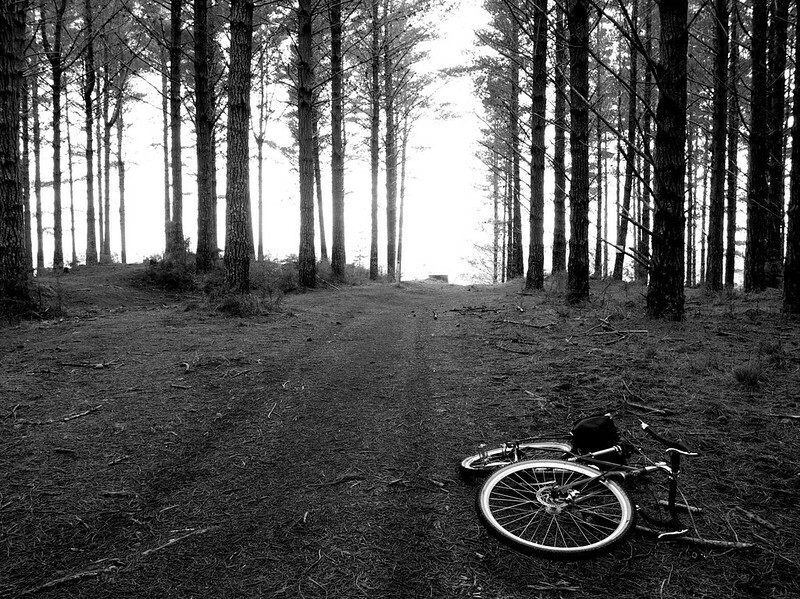 I hesitated for a bit, then caved in to my own good nature and gave him my spare tube, after soliciting a promise from him to give the tube back to me, if he found me by the side of the trail with a flat tyre of my own. Now up until this point I had, I must admit, found myself unexpectedly caught up in, well, racing. But after stopping for a few minutes, and then being alone back on the track, I remembered that I was just here for a nice ride. So I slowed down even more, started taking pictures and enjoying myself. 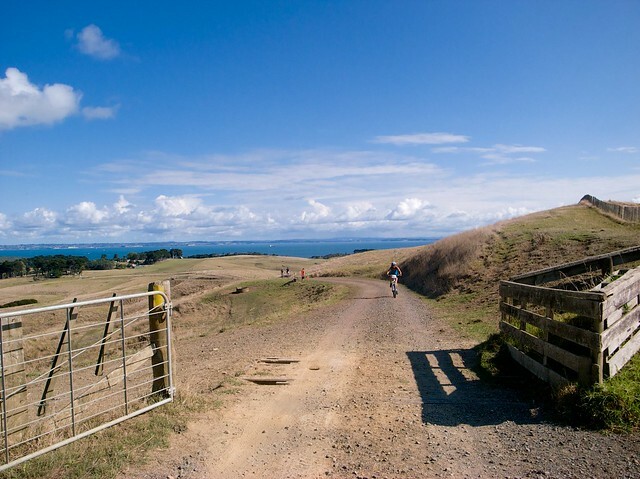 Fortunately that descision coincided with a really beautiful section of the course that took us back across Rangitoto to Mototapu. From there it was more gravel roads back to Home Bay where we started, then back up & down some more hills, followed by a turn off to the extra loop for the 50k’ers that the 30km course didn’t take. This section started off fairly innocuously as a left turn on to some grass. But it soon became clear that this section was a tour through Mototapu’s armpit. It’s a beautiful armpit I’ll grant you, but the surface alternated between cowpat-ridden long grass, and fields so dry and sunbaked, it was like riding over lumps of smashed concrete. The un-suspensioned Off-Roadrat was not so happy in these conditions. One real bright spot was an aid station we came to. I was coasting gracefully down the side of a hill (like a chimp on a skateboard coasts gracefully down a sheet of corrugated iron) when I spotted a secret military training base Well that’s what it looked like, except that the buildings all had solar panels on their roofs – a secret GreenPeace para-military training camp perhaps? That would also have explained why the aid-station there, was staffed by the nicest and most enthusiastic children I have ever met. One of them said to me “You can have water or some energy drink.” While I was deciding, she added “It’s not really energy drink, it’s just water with a bit of cordial in.” which was fine with me. Fortified with cordial, enthusiasm and a barley-sugar, I continued. And then there was more grass and more cowshit and more fences, and then every few kilometers there would be a person directing us where to go. 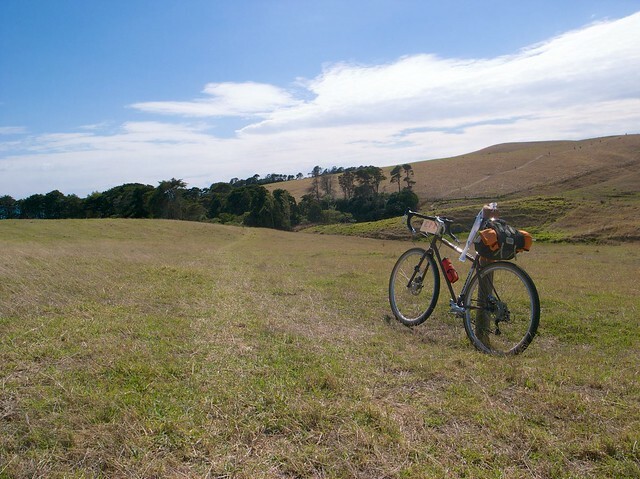 Finally we made it back on to the gravel roads – I was very relieved. They had told us at the briefing that the very last leg was all downhill, so everytime the road went down, I thought, is this it? Is this the last downhill? But none of them were. Eventually I arrived at an intersection and was directed, along with a whole lot of runners, to a grass path heading up a hill. This turned out to be the least enjoyable part of the course. It was more rock-hard uneven ground, but now with a million runners and another million walkers. At times there was a relatively smooth path, but it was jammed with walkers, so I was constantly saying “excuse me” so they would step aside and I could stay on the path. This didn’t work on one guy who told me he couldn’t move sideways because he had snapped his achilles tendon. 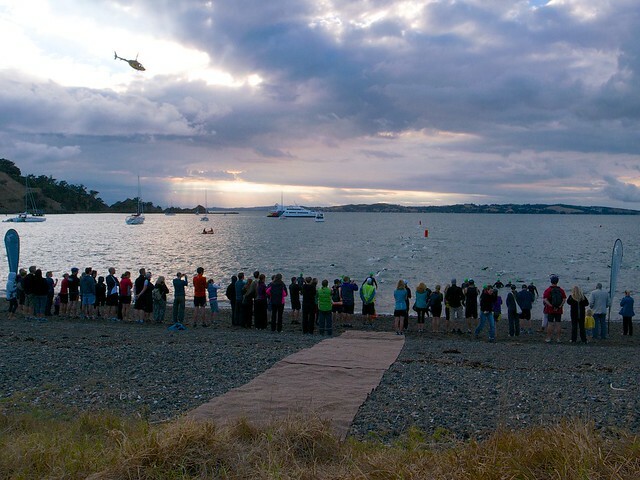 Finally I made to the home stretch – the descent to the finish line in Home Bay. 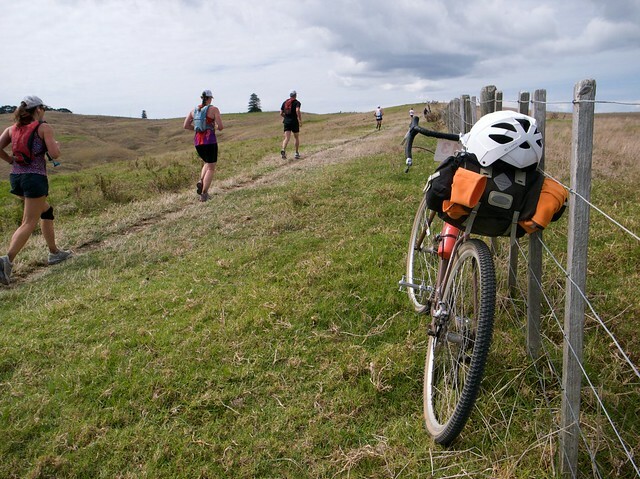 This turned out to be not much fun at all – steep hill, lumpy surface etc. Fortunately it didn’t last too long and I was able to totter across the finish line and collapse under a tree. I got up after a while and had a beer. Then I had a second beer – I believe this is acceptable post race hydrating. Now, I know not everyone is as enthusiastic as me about daylight saving. There is apparently a woman in Queensland who blames all those extra hours of government sponsored sunlight for making her furniture fade. But riding home from work while it’s still light is nice isn’t it? 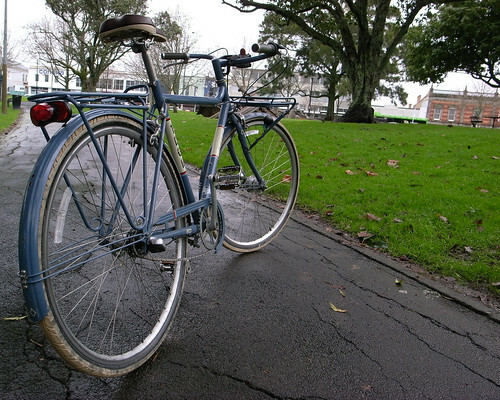 And this is the bicycle that got me through the long, damp Auckland winter. Yes, it’s my old friend the Bridgestone MB4 – looking much more ride-to-work friendly than when it came out of the factory back in the early 90s. You will notice, it now has some comprehensive mudguards (Planet Bike) new tyres (Compass Bicycles) moustache handlebars (Planet-X-Bikes) and a discrete, yet semi-permanant light (DKG). As I have blathered on about before, I reckon mudguards are virtually essential for a practical bike, and I think these ones are very good. Easy to put on and specially designed for mountain bikes – so they’re pretty wide. They are also very sturdy & non-rattly. Except when you don’t bother to tighten up the bolt on the rear brake bridge properly, and then the nut falls off while you’re riding home. But even then, there’s enough other stays to hold them on, so you can fix it when you get home. Or so I’ve heard. Ahem. The previous set of tyres I had on this bike were Schwalbe Super Motos. 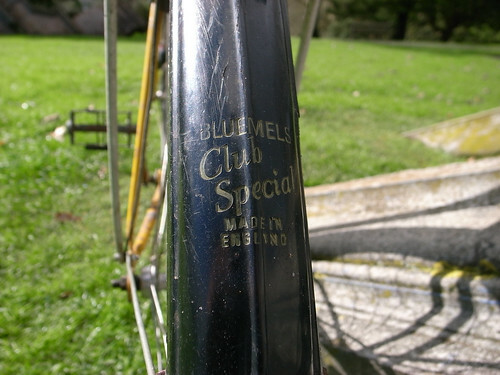 Brillliant though they were, mudguard-friendly they were not. So I replaced them with some similarly exotic, but more conservative looking tyres from Compass Cycles. They are made by Panaracer for Compass, which is why they look very much like Panaracer Paselas. 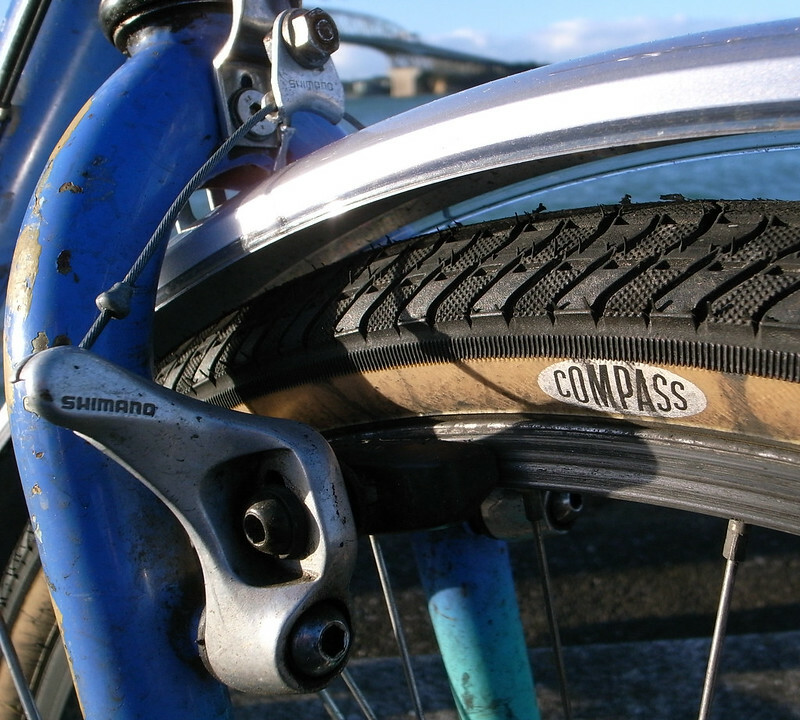 According to Compass, their version of the tyres are made to a higher standard, and therefore roll better. I haven’t tested this properly, but they certainly feel fast. The front light is slightly unusual – it’s an LED Maglite held on with a bracket from DKG. 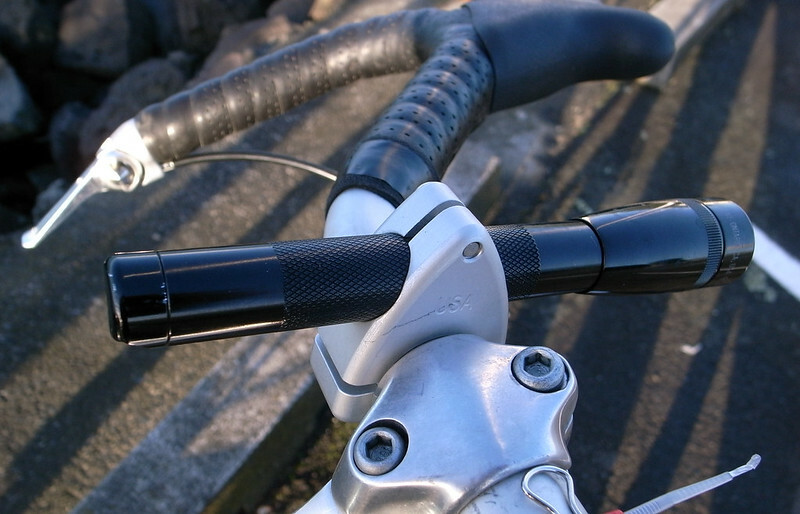 I really don’t like the way most bicycle lights these days are clamped on to the handlebars with crappy plastic brackets. This one is machined from solid aluminium, and is of excellent quality. Is this the perfect ride-to-work bike? Not really. But it’s pretty good. 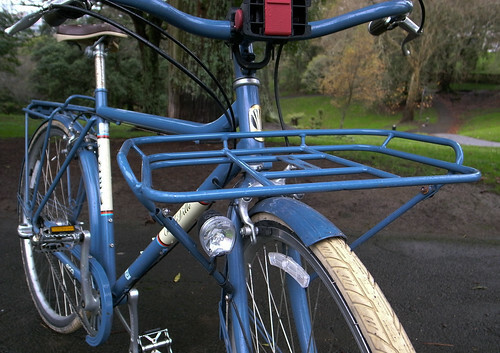 The 26in wheels make it agile for city riding, and it looks crappy enough to be fairly theft-resistant. Also, there’s a shortcut I sometimes take, which involves a brief climb up an incredibly steep street. So, thanks to the mountain bike gearing, I can chuck it into first & grind slowly up – a handy feature at 7:30 in the morning when you’re half asleep, and cold. 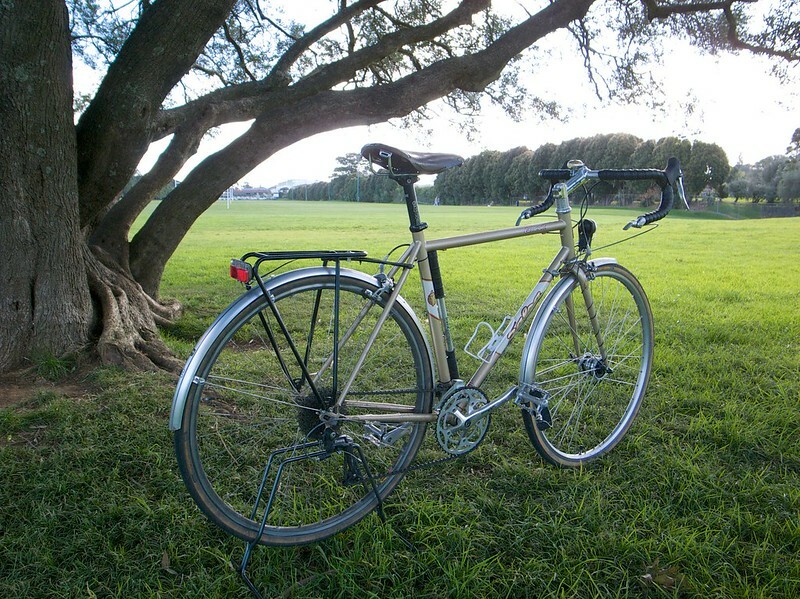 A few weeks ago, I saw a bicycle advertised for sale on a popular New Zealand auction website. I was tempted to bid because it was priced very reasonably, and I remembered seeing this particular model when it first came out, and thinking that it looked pretty good. It’s a Trek Belleville. Cyco on Ponsonby Rd used to sell them. But then an associate of mine bid on it, and I also remembered that I already have a million bikes. So I didn’t. He duly won the auction and asked me to pick it up for him. So I did, and took the liberty of going for a couple of rides to see what I had missed out on. 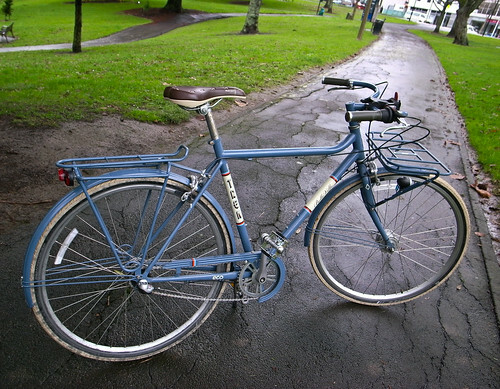 I think it was the first practical bike that I ever saw for sale in New Zealand. It also stood out from the other bikes in the shop, by being really nice looking. 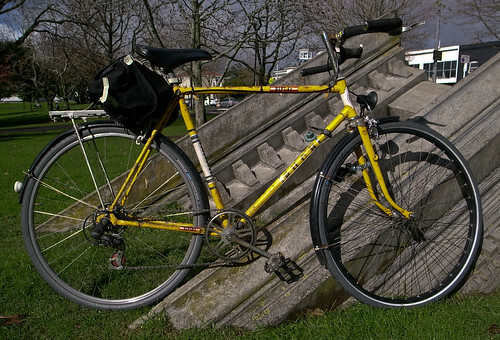 Partly it was the retro look, and partly it was the way all those useful extras like the mudguards, chain guard and racks, looked so much better because they were designed to go with it. The extent of my “testing” was to ride it home from the pickup, which was about 10k. And taking it to work one day, which was another 9km or so. And… I liked it. The 3-speed transmission was very nice (I do love a 3-speeder). The racks & mudguards were very solid & didn’t rattle. 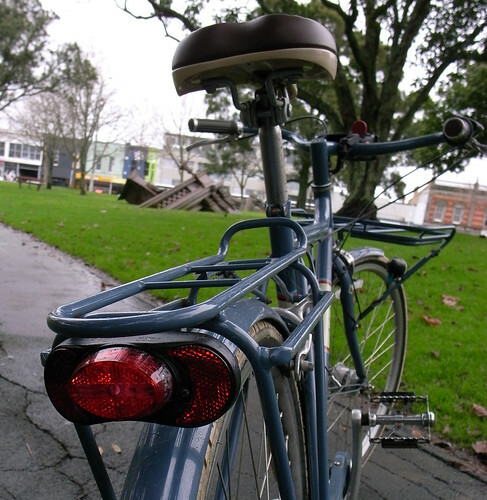 The front light, with the hub dynamo worked pretty well – not amazingly bright, but good enough for the city. Also, people I met said nice things about it. It was fun to ride. 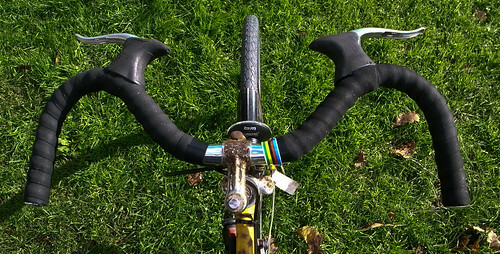 I do have some criticisms – the hand grips and the saddle were horrible, but no big deal to replace. And I didn’t really understand the front rack. Because it didn’t have a rail on the front, you can’t just dump things in there like you can with a basket. It needs something like a cargo-net or bungy cord to hold them in place. In fact the previous owner had by-passed the rack and just put a basket on the front (I took it off for the pictures, but you can see the plastic bracket on the handlebars). There are a couple of slots in the middle of the rack – perhaps there was some helpful accessory that went there? I don’t know. Also, the brakes were pretty average, but that might be fixed with a decent set of pads. On the whole though, it’s a very attractive and useful bike. In a previous post, I referred to my Cotic Roadrat as my “Everyday Bicycle”. I also mentioned it’s lack of mudguards. 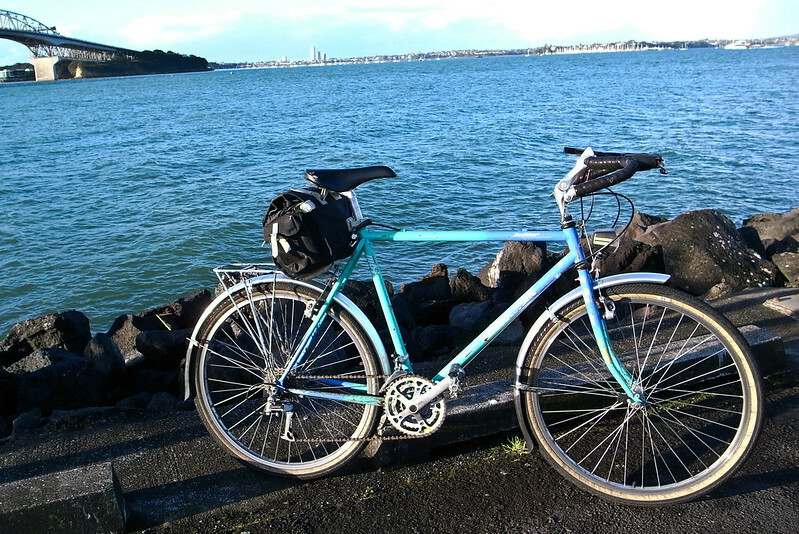 So when it scarcely stopped raining in Auckland – “The Seattle of the South Pacific” – for a couple of weeks, I assembled a different “Everyday Bicycle”. One with mudguards. Let me introduce The Puch. 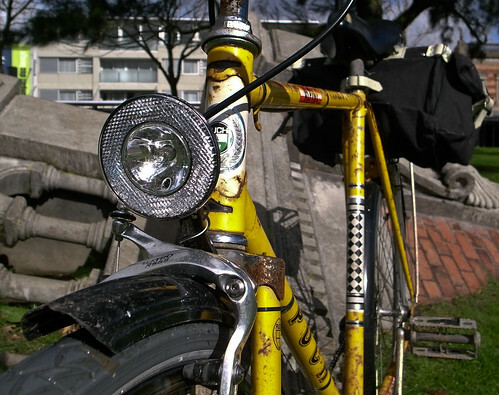 It’s not an especially pretty bike, although it probably was back in the 1970s when it came out of the Puch factory in Austria. I spotted this particular vehicle on a well-known local Internet auction site and arranged to purchase it for the very reasonable sum of $10. 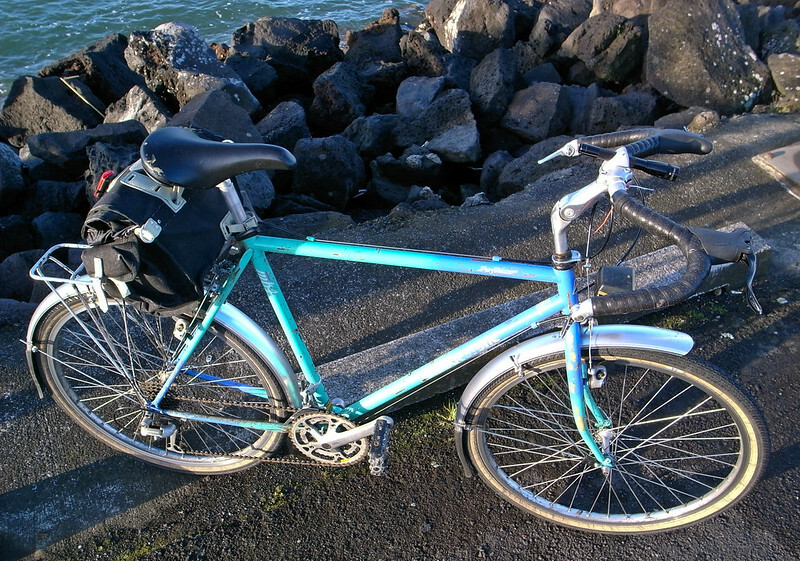 There was some work required – I replaced the handlebars, wheels, front brake, brake levers and derailleur. 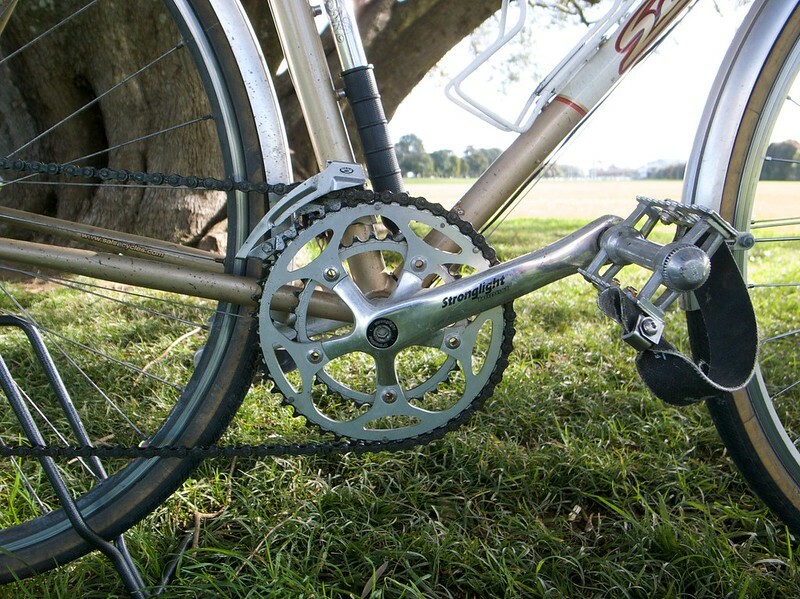 As a general purpose bike it has some shortcomings – the chain has a tendency to fall off if I change too quickly in to a higher gear, and the actual levers are placed, not very conveniently, at arms-length. And then there’s all that.. ahem.. rust. 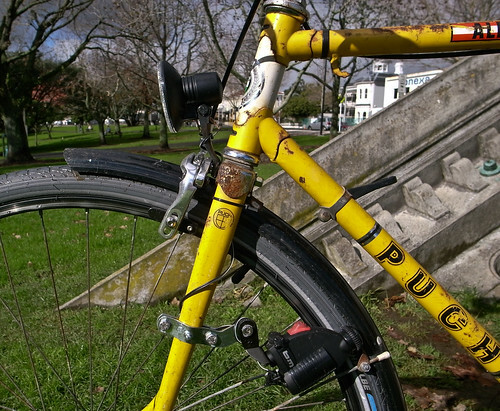 But The Puch also has some excellent qualities – the aforementioned mudguards, a surprisingly comfortable riding position and a pair of very nice Schwalbe Marathon Racer tyres. 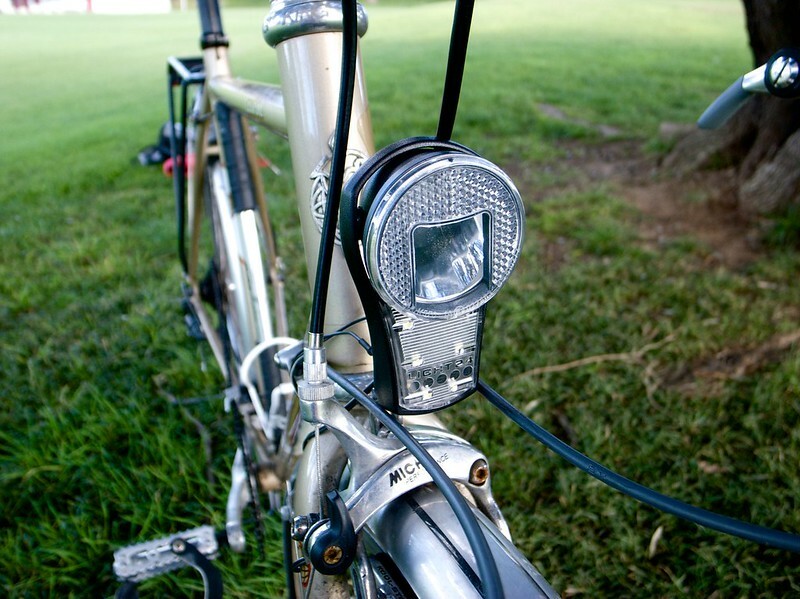 And… a dynamo powered headlamp. The lights were also an addition of mine. They are made by Busch+Muller. The headlight has a facility called a standlight – meaning that it stores a bit of charge from the dynamo, so that when you are stopped at traffic lights, the headlight stays on for a few minutes. It doesn’t produce an enormous amount of light, but it’s enough to see by if I find myself in an area without streetlights. Thanks to the dynamo, I don’t have to worry my pretty little head about batteries, and it makes a pleasantly loud whirring noise that warns pedestrians and frightens dogs.